I thought it was a fabulous idea! So while I'm away, I'm going to share some of my favorite posts from some of my favorite bento peeps, focusing mostly on hearts/love/Valentine themes to help give y'all some inspiration with the upcoming holiday! First up, naturally, is the infamous Ludicrous Mama! Ludicrous Mama makes adorable bentos and muffin tin meals for her daughter, Little Z. Her daughter refers to them as "Beautiful Lunches" - and that they are Z! She referred to it as "Eating with the Queen of Hearts". So cute! Love the crown, picks, and the pink sprinkle heart added to the yogurt cup. I love that Ludicrous Mama keeps it simple - fruits, veggies, cookie cutters, and adorable picks. Easy enough for anyone to do, much like the bentos I make for Little Miss. Here's another fantastic heart themed muffin tin meal she made for Little Z: "Be Mine, Valentine!" The "Be Mine" is a PBandJ tortilla! How adorable and creative is that?! Love the little details, going as far as the teeny-tiny heart carrot bites. :) Little Miss would love that! Little Miss would be so jealous if she knew Little Z got these wonderful Sleeping Beauty bentos! 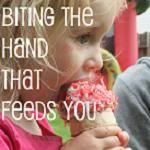 You can checkout more of Ludicrous Mama's lunch love (and sarcasm) on her blog Biting The Hand That Feeds You or on Facebook. Haha awesome! Ironically, I saw this post via my blogroll list! Sneaky Mama!